Download this case study from Rosenthal & Rosenthal to see how your business can help boost client satisfaction and cut costs. For organizations trying to juggle multiple EDI systems, a centralized solution based on IBM® Sterling B2B Integration Services will enable a faster, more efficient transaction processing. 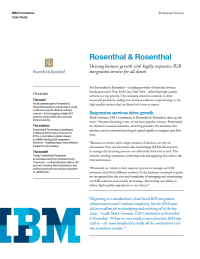 Rosenthal & Rosenthal, working together with an expert team from IBM, analyzed its existing trading partner connections and planned the changes required to transition its EDI and FTP services to the IBM cloud.